The Body Shop Love Etc. If I had to pick one fragrance that would be the very best example of fruity floral, it would have to be Love Etc. Typical smelling, yet it gets everything right about what a fruity floral is. Love Etc. is a perfect, generic fragrance. But one that I believe is the “standard” for its genre. In Bottle: Bergamot with a layer of jasmine and a fine vanilla background to sweeten up the fragrance. There is some other note in there too. I’m going to hazard a guess and say it’s berries that I think I’m smelling over a nice tangy, citrusy scent. Applied: Bergamot with a mix of jasmine and that perpetual very nice and just-sweet-enough vanilla. The fruits in this are a mixture of tart and sweet as they mix well with the florals to create a gentle fruity fragrance that’s not too sweet or too floral. Love Etc. is a fruit salad with a dollop of cream that cuts the tartness of the fruits. I’m no good at picking out fruit notes but the pear is in there with what I’m swearing is a vibrant berry-like scent. This fragrance is like an edible platter of fruits and flowers that develops into a soft, plush, vanilla and cream dry down. It’s highly wearable, very young, but also tasteful. Extra: The Body Shop is a bath and body company. One of its most famous fragrances, still being made today, is White Musk. When I smell White Musk, I’m reminded of the 90s because it seemed like everyone was wearing it at the time. Design: Love Etc. is bottled in a small, squarish glass container with a metal cap on top. I love the design, mostly for its function rather than its form. As a perfume bottle, it’s kind of plain but the price point agrees with the appearance. Love Etc.’s bottle is also small and compact enough to throw into a purse and go. Notes: Bergamot, neroli, pear, berries, jasmine, heliotrope, muguet, vanilla, cream, sandalwood, musk. Love Etc. is probably in the running to be The Body Shop’s popular everyday fragrance. It was released some time in 2009 and just reminds me of every other fruity floral I’ve smelled. The fact that it’s generic shouldn’t be taken as a bad thing. If anything, Love Etc. is the catch-all, “if you’re unsure then try this”, fruity floral. 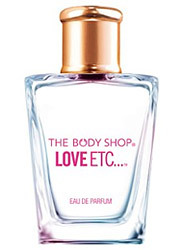 Reviewed in This Post: Love Etc., 2010, Eau de Toilette. This entry was posted in floral, fruity, Reviews By House, the body shop and tagged bergamot, body, etc, floral, fragrance, fruity, love, perfume, review, scent, shop. Bookmark the permalink.